A 12-piece set of 5 cubes joined together in every 2 dimensional combination possible. 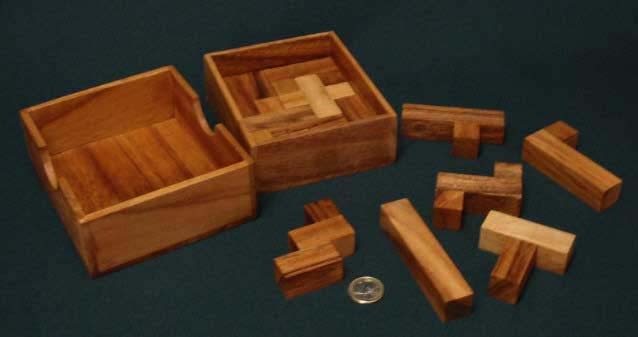 Packing problems, constructional puzzles and games can all be played with this amazing set of solid forms. A great way to introduce some fun into the realm of mathematics and to begin to explore the sometimes strange relationship it has with art. The rules for 3 games for 2 players are included. Puzzle instructions included. Solutions available..
Dimensions 143 x 125 x 50 mm, Weight 500 grams.